NORTH PARK, ENCINITAS, MIRA MESA, OCEANSIDE. I have certainly been remiss in posting. A trip to the east coast, a baby shower, and playing with my one and a half year old nephew have all kept me away from this blog. I’m back now and have some good posts lined up for everyone! Today’s post is all about Swami’s, a delicious casual restaurant that has great vegan options. Swami’s used to be mostly relegated as my “post surf” dining spot I visited when I was up in Encinitas. Happily, they have now opened a location closer to my home in North Park (in Casa de Luz’s old space). I’m thrilled that this restaurant can now be added to my regular rotation. For me, ordering the vegan Spinach Tofu entree is a tradition. The idea is simple: fresh spinach, potatoes, onions, tofu lightly sauteed in canola oil are mixed together and served over brown rice with a side of toast. I love this dish for breakfast or lunch. It’s filling and features a healthy serving of greens! We then decided to try something new from the menu, the Spicy Ginger Wrap. 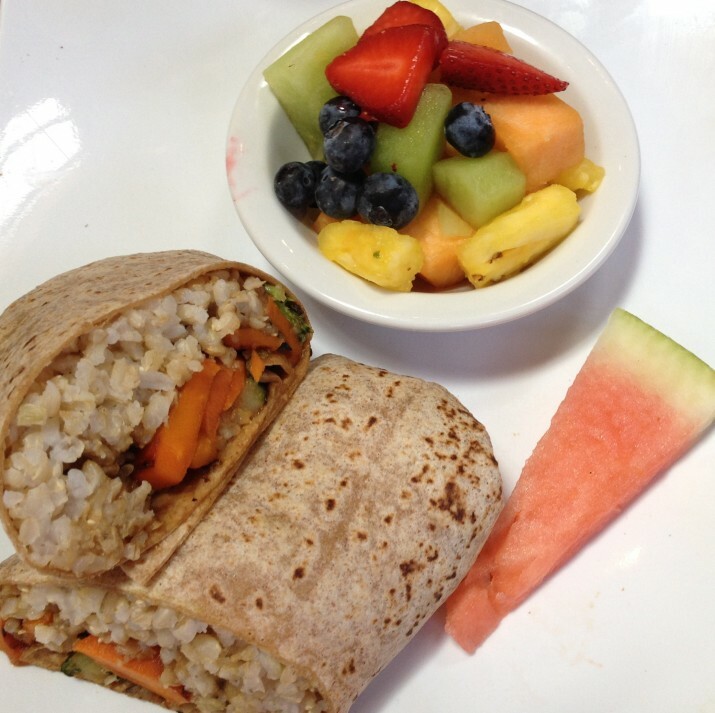 A whole wheat tortilla encases fresh veggies and brown rice that have been sauteed in a spicy ginger sauce. I liked but did not love this wrap. I was expecting crispy veggies with rice in a strong, bold ginger sauce. Instead, I found that the veggies were soft and were covered in what I would describe as a mild ginger sauce. I am sure there are others out there who would enjoy this wrap. Just know that the name of the dish is a bit of a misnomer. Swami’s does side salads right. A mix of bright greens, sprouts, and veggies will arrive at your table with your choice of dressing on the side. Everything is fresh, crunchy and ready to eat! This smoothie is the perfect blend of tart and sweet. It was delivered to the table before our entrees arrived and very little remained when it came time to eat. Menus are provided at the entrance of Swami’s and customers are able to take a look at the comprehensive menu before ordering at the front. The Swami’s cashier will give you a number to place on your table once you have ordered. Swami’s has plenty of indoor seating available. Large windows and high ceilings ensure the restaurant feels open and has plenty of light. The outdoor patio area is also a great option for those looking to enjoy a San Diego morning or afternoon. I hope you get a chance to enjoy the food and ambiance at Swami’s soon!